WASHINGTON, DC, June 10, 2010 (ENS) – To protect the health of farmworkers and wildlife, the U.S. Environmental Protection Agency is taking action to end all uses of the pesticide endosulfan in the United States. Endosulfan, which is used on vegetables, fruits, and cotton, “can pose unacceptable neurological and reproductive risks to farmworkers and wildlife and can persist in the environment,” the agency said in a statement Wednesday. Also used on ornamental shrubs, trees, and herbaceous plants, it has no residential uses. 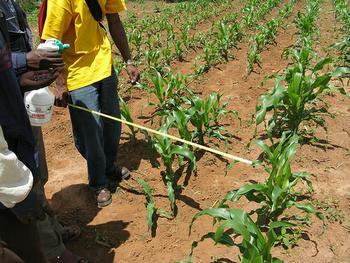 An organochlorine insecticide first registered in the 1950s, endosulfan is a persistent, bioaccumulative pesticide. Some 700 tons of endosulfan are used annually in the United States, according to the EPA. While EPA did impose various restrictions in a 2002 re-registration decision, the phaseout announced Wednesday is based on new data and scientific peer review, which the EPA says have improved the agency’s assessment of the ecological and worker risks from endosulfan. New data generated in response to the agency’s 2002 re-registration decision have shown that risks faced by workers are greater than previously known. Farmworkers can be exposed to endosulfan through inhalation and contact with the skin. EPA’s 2010 revised ecological risk assessment reflects a comprehensive review of all available exposure and ecological effects information for endosulfan, including independent external peer-reviewed recommendations made by the endosulfan Scientific Advisory Panel. EPA is currently working out the details of the decision that will eliminate all endosulfan uses, while incorporating consideration of the needs for growers to timely move to lower-risk pest control practices. Makhteshim Agan of North America, the manufacturer of endosulfan, is in discussions with EPA to voluntarily terminate all endosulfan uses, the agency says. The company, based in Tel Aviv, Israel, sells its crop protection products in over 100 countries. Makhteshim Agan of North America, MANA, located in North Carolina, is the only U.S. producer of endosulfan. The company markets the pesticide under the names Thionex 50W and Thionex 3EC. In 2008, the NRDC petitioned EPA and filed a lawsuit seeking a ban on this pesticide. These efforts supported a coalition of scientists, Arctic tribal governments, Arctic indigenous peoples, and worker protection groups who wrote letters to the EPA calling for endosulfan to be banned in the United States. There are no epidemiological studies linking exposure to endosulfan specifically to cancer in humans, but some tests have shown that endosulfan can promote proliferation of human breast cancer cells. Cancer researcher Dr. Ronald Herberman, director of the University of Pittsburgh Cancer Institute, joined with NRDC and over 55 international scientists, medical doctors, nurses, and other health professionals to support a ban on endosulfan in a 2008 letter to then EPA Administrator Stephen Johnson. AT that time, EPA took no action. Endosulfan is already banned in over 60 countries including the European Union. A global ban on the use and manufacture of endosulfan is being considered under the Stockholm Convention. The ATSDR explains that endosulfan enters the air, water, and soil during its manufacture and use. When sprayed onto crops, the spray may travel long distances before it lands on crops, soil, or water. Endosulfan on crops usually breaks down in a few weeks, but endosulfan sticks to soil particles and may take years to completely break down, according to the ATSDR. Endosulfan does not dissolve easily in water. Endosulfan in surface water is attached to soil particles floating in water or attached to soil at the bottom. Endosulfan can build up in the bodies of animals that live in endosulfan-contaminated water. EPA also finds that there are risks above the agency’s level of concern to aquatic and terrestrial wildlife, as well as to birds and mammals that consume aquatic prey that have ingested endosulfan. Endosulfan affects the central nervous system and prevents it from working properly, warns the ATSDR. Hyperactivity, nausea, dizziness, headache, or convulsions have been observed in adults exposed to high doses. Severe poisoning may result in death.